One of the best ways to live rich on a small budget is to learn how to never pay full price for anything. There are so many great ways to save money on your everyday purchases, which means more money left in your budget. When I was in college, money was extremely tight, so I was ALWAYS looking for ways to save whenever possible. Many of the frugal habits I follow are from my mom. When you combine these frugal habits with today’s technology, you’ll be able to save thousands of dollars a year by not paying full price for things. 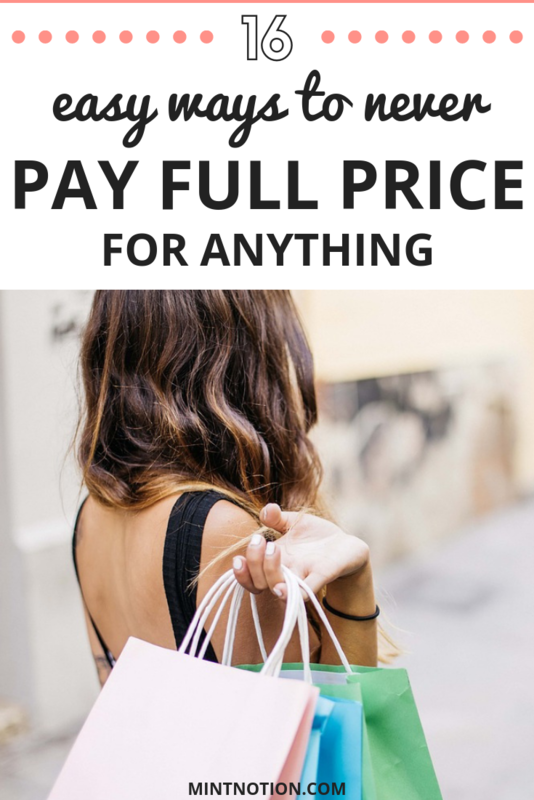 If you’re interested in learning all my tips and tricks for saving money, here are 16 easy ways to never pay full price for anything! By spending a few minutes comparing prices online, you can save yourself extra money. For example, if you’re looking for a pair of shoes, you can type in what you want to buy 0n Google and click the “shopping” tab to easily compare prices. You can also create a Google price alert to let you know when the price has dropped for a product that you’re interested in buying. This is a great way to save both time and money. There are so many great cash-back apps today that make it easy to save money on all your purchases. One of my go-to sites for shopping online is Ebates. It allows me to earn up to 20% cash-back at all my favorite stores, including Amazon and Walmart. Ebates is a legit company and I always use them to save money when shopping online. Instead of always buying new, consider checking out the selection at your local second hand shop first. Many thrift and vintage shops sell items in almost new condition for less than you would find at a regular store. This is an excellent way to save money and help the planet. When I was in college, I worked part-time at a local second hand clothing store. I was surprised at how many items still had the original price tag attached. You never really know what kind of deals you’ll find in thrift stores! PRO TIP: I recommend shopping for clothes on Swap.com. This is the largest online consignment and thrift store, and it’s a great way to save money on your favorite brands. You can also sell your own new or pre-owned clothing on Swap, along with toys and games for kids. This can be a good way to make extra money. Many online retailers offer a discount for new email subscribers. This can be a great way to save up to 20% off your purchase. Once you’re subscribed to retailer emails, you’ll be the first to know about special offers and promotions. I recommend creating a separate email address to keep track of retailer emails. PRO TIP: To prevent being tempted to spend money each time a new sale pops up in your inbox, only login to this email address when you need to shop. This way you’ll save money and not buy things just because it’s on sale. I use my credit card to pay for almost everything so I can collect travel rewards. (Of course, I also pay off my credit card in full each month.) These travel rewards can be redeemed for free car rentals, hotel stays, flights, and more. Sometimes workplaces or schools may offer perks. This can help you save money on transportation costs, clothing costs, lunch costs, entertainment costs, and more. Membership programs can also offer rewards. For example, with my Costco membership, I can get discounted movie tickets, travel deals, cheap gift cards to local restaurants, and more. PRO TIP: I like using Swagbucks to get rewards. With Swagbucks, you can earn cash and gift cards for things you already do online, such as surfing the internet, playing games, and filling out surveys. Sign up for Swagbucks and get a $5 welcome bonus! Each week, I like to spend about 10-15 minutes looking through the flyers. This allows me to see what’s on sale and compare it with my shopping list. For example, when I was looking for a new mattress for my apartment, I looked through the furniture store flyers each week and waited for a sale. I also like to shop by the flyers when doing my weekly grocery haul. This gives me a chance to create a meal plan based on which items are on sale that week. Do you need some meal planning inspiration? Lately, I’ve been loving every recipe in Chloe’s Cookbook. Her recipes are quick and easy to make, which are great for busy weeknights when I need to whip up something fast. Plus, everything I tried so far has been absolutely incredible! It’s a win-win! Sometimes you can get perks through your job to help you save money. For example, my dad used to work in the hotel industry. One of the perks with his job was getting free hotel rooms. This was a great way to save money on family vacations. My boyfriend’s job offers him a company car. This allows him to save money by not having to pay for car payments (including regular maintenance and gas). Blogging professionally also has a lot of perks. For example, sometimes you can get items for free (in exchange for a review), free or discounted hotel stays, free entrance to special events, and more. You can learn more about how to start a blog here. Being a flight attendant can also have great perks. One of our family friends worked as a flight attendant and she was able to fly for free. This is a great way to save money when traveling. Go ahead and put items in your online shopping cart. Just make sure you don’t click the purchase button… yet! Sometimes online retailers offer discounts to encourage you to come back and buy what you left in your shopping cart. Check your email, or you might get an offer code when trying to leave the website. Do you want new clothes, but don’t want to spend any money? See if you can swap items with friends. I do this all the time with my sister. It’s a great way to get rid of items you no longer wear and you’ll get something nice in return. PRO TIP: Host a clothing swap with your friends at the beginning (or end) of each season. This can allow you to declutter and gain new pieces without spending money. Flash sale websites offer incredible discounts on a number of different items, including clothing, accessories, furniture, restaurants, spa treatments, activities, and more. I’ve used sites such as Groupon and Gilt to save money at fine dining restaurants, my invisalign braces, hotel rooms, fashion, haircuts, and more. SIDE NOTE: In my experience, flash sale sites can be addictive. I recommend only visiting these websites when you need to buy something. Otherwise, you may end up buying things just because it’s a great deal. Many stores offer coupons or promo codes to help you save extra money. Before shopping in-store or online, I recommend doing a quick Google search to see if there’s a coupon or promo code available. This can help you save up to 50% off your purchase. The key to not paying full price for anything is patience. Almost everything will eventually go on sale, or you’ll find a way to get a discount. For example, clothing will go on sale near the end of the season and electronics get discounted when new models become available. While this may not work for early adopters, you can save some serious money by waiting for a sale. For example, when I bought furniture for my new apartment, I made a list of items that I needed and waited for these items to go on sale. This allowed me to buy what I wanted without having to pay full price. Buying refurbished products can land you an incredible deal. In most cases, you can get a product in almost new condition without having to pay full price. Plus these products have been rigorously tested for peace of mind. I like searching on Amazon for refurnished items to save money. Just make sure to check the warranty. Enjoy your special day by celebrating with birthday freebies. Many restaurants, retailers, and salons offer discounts or freebies on your birthday. Check ahead to see if you need to sign up for their mailing list in order to get your birthday coupon. We celebrated a birthday recently at one of our favorite restaurants and they offered a free dessert. This is a good way to save money. A smart way to never pay full price for anything is to stock up on items you use regularly when they go on sale. For example, I like to stock my pantry with staples such as beans, oatmeal, rice, pasta, toothpaste, shampoo, toilet paper, and so on. I buy these items in bulk when they go on sale so I’ll always have easy access to these goods when I need them. You’d be surprised at how often you can get a discount simply by asking. This is especially true if the item you want to buy has a flaw. For example, when we bought a mirror for our dining room, there was a mark on the frame. We could easily fix this with a wood furniture marker, but we pointed it out to the store staff and asked for a discount. We were able to save almost 50% off the original price! While you may not always be able to immediately score a discount, sometimes the store staff can let you know about an upcoming promotion. For example, when we were looking to buy our couch, the store staff told us if we waited until next weekend, we’d be able to get the couch on sale and not have to pay tax. This was an excellent way to save money and not have to pay full price! Over to you — what are your tips for saving money?